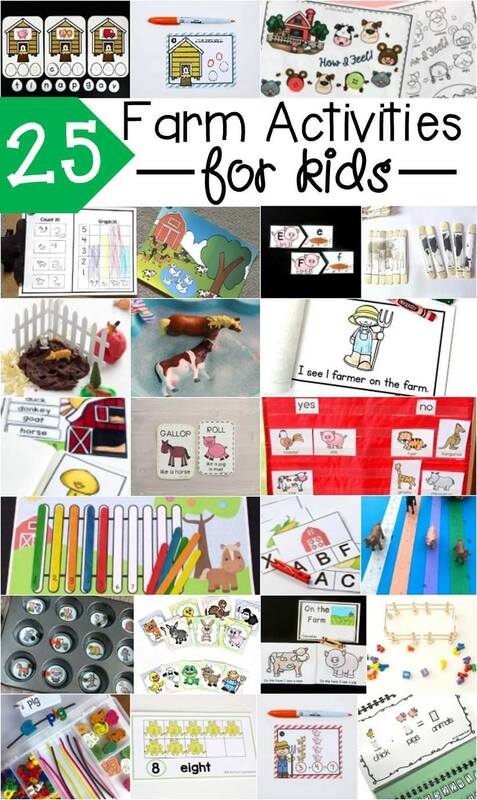 Have you ever met a preschooler who doesn’t love learning about farm animals? 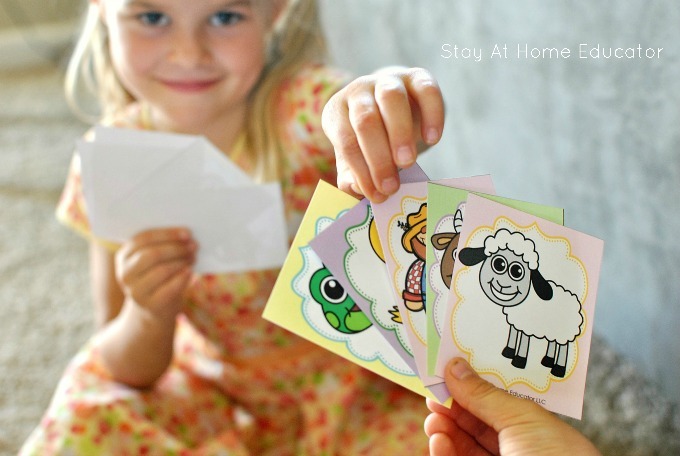 My preschool classes have always been so responsive to any farm activities I present them, and this Old Maid inspired card game was no different. My preschoolers adored it, and so I’m sharing my farm theme printable with you, and it’s completely free, too! Last Christmas my mother-in-law sent my kids a game of Old Maid and let me tell you…none of us were prepared for what a hit that silly card game would be! It was most hilarious when my husband or son picked the old maid from my daughter’s hand. She was only four at the time and could not keep a straight face. And she would giggle uncontrollably and practically fall off her chair! Old Maid is a simple game, perfect for preschoolers, and while the rules are very straight-forward and easy to follow, the game actually offers some wonderful skill builders. Children draw cards from one another in an effort to find a match to something they already have in their hand. This is great skill practice because it works the children’s sorting and visual discrimination skills. Sorting is a mathematical skill and visual discrimination is a precursor to reading and writing. Old Maid is a fun game for preschoolers, and luckily it also has some wonderful educational benefits as well! The object of the game Old Maid is to make as many matches as possible without getting stuck with the “old maid”. In the case of my farm theme printable game, you don’t want to get stuck with the farmer. This game is designed for just a few players, maybe four or so, certainly no more. You could play with more, but you’d want to make more copies of the game. Distribute the cards, face down, evenly to all players. Once they have been delt, the preschoolers can then look at their cards and make any matches from their hand. The matches are placed off to the side of each player. Now, the game can begin. Select a preschooler to go first. That player draws a card from another player of his choice. If the card is a match to one in his hand, he can place the match with the others he is collecting. The game continues to the next player and continues until all the cards have been matched and one player is left with the farmer card (“old maid”). The anticipation of which card will be drawn is sometimes unbearable. The player holding the cards must keep a straight face to keep from giving away if the person drawing is grabbing the farmer card. My daughter is terrible at keeping a straight face, but my son isn’t so bad at it! Corinne’s shoulders dropped when she realized she had drawn the farmer card from my son. She fell right into his trap and drew from the very center of his hand. Then the challenge became to find a way to get another player to draw the farmer card from her hand! In a typical game with my preschoolers, the farmer card gets passed around several times. As the game progresses, more and more animal matches are made, increasing the probability of drawing the farmer card until there is a 50/50 chance. One of my favorite things about this game is that it is fast passed and keeps the children interested as well as an easy and gentle way to teach sportsmanship. 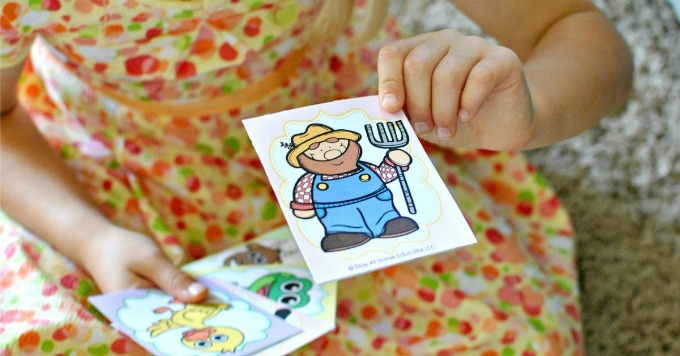 Some preschoolers will be upset they “lost” the game by being left with the farmer card in their hand, but since the game only takes five minutes or so to play, it’s easy to convince said preschooler it’s all for fun and to play again. And may I just mention that this is a great game to keep kids occupied while having to wait in public places? It fits easily in Mom’s purse, so it’s the perfect things to pull our while waiting at a restaurant or doctor’s office. Print the cards in color, preferably on heavy cardstock and then laminate and cut apart. You will need to print at least two copies of the cards, so matches can be made, but remove the second farmer card. If you are playing with a larger group, no worries! Just print another two copies of the cards, but remove all of the farmer cards from the second batch. You only want one farmer card per game, and you must have enough copies of all the other cards to make matches. (Yes, that means even numbers). 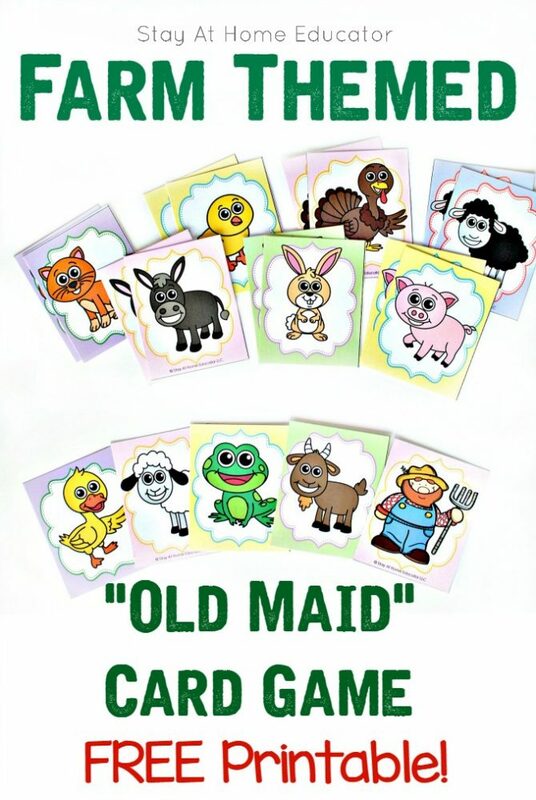 Get Your FREE Farm Theme Printable Old Maid Card Game! Think this is something your preschooler will love? (Say yes. Because I know your preschooler will adore this game). You can download your free copy below. Looking for More Farm Activities? I’ve paired up with the best kid bloggers to bring you so many other farm themed activities for kids. There’s enough awesome ideas here that you can probably do all your lesson planning from this one post! I wonder how long my son will be able to keep a straight face for! What a fun game this sounds.